Service animals are allowed on all flights at no charge. They need to be able to fit on your lap, at your feet, or under the seat, and cannot block the aisle. Service animals are also not allowed in exit rows. The same rules apply for emotional support animals. Emotional support animals and psychiatric service animals will need to submit a doctor’s letter, less than a year old that meets several requirements, to the airline 48 hours before the flight. For those flying with pets, only small cats and dogs are allowed in the cabin at a $125 fee and they must stay in a carrier, that fits under the seat in front of you, at all times. Travelers can also fly their cats and dogs in the plane’s cargo hold for $175 fee with some capacity and weather restrictions. Delta recently changed their policy on service and emotional support animals. Owners need to submit the airline’s required documentation 48 hours prior to the flight to be able to board with their service or emotional support animal. The animal should be able to fit on the passenger’s lap or in the space under the seat in front of the passenger. Delta reserves the right to refuse service to owner’s of animals with disruptive behavior. For passengers traveling with a pet, small cats, dogs and household birds are allowed to travel in the cabin for a fee that varies based on the traveler’s destination. The pet must remain in a carrier at all times and the carrier must fit comfortably in the space under the seat in front of the passenger. Delta can also ship animals via Delta cargo, prices vary. This service is only open to warm-blooded pets. Southwest allows service and emotional support animals to fly on flights. The animal can be no larger than a child the age of two, and has to be able to be placed on the passenger’s lap or on the floor in front of their seat. Service and emotional support animals cannot be placed in an airplane seat. Those flying with emotional support animals will need to bring a letter from a medical health professional that meets the requirements of Southwest. Cats and small dogs are allowed to travel with their owners for a fee of $95. Approved pets must remain in their carrier at all times and be able to fit under the seat in front of their owner. Southwest does not fly pets in the cargo holds of their planes. Only six pets are allowed pet flight. United allows trained service animals in cabin for qualified individuals with a disability. A service animal should sit in the floor space in front of the customer’s assigned seat but cannot protrude into the aisles. The same rules apply for emotional support animals, which also need to be trained to behave on plane. Owners of emotional support animals also need to present certain information and documentation to United before traveling. United allows domesticated cats, dogs, rabbits and household birds (excluding cockatoos) to travel accompanied in the aircraft cabin on most flights within the U.S. for $125 service charge. The pet must stay in their carrier, which must fit completely under the seat in front of the customer and remain there at all times. Service animals fly for free and must occupy the travelers own space without obstructing aisles. Those traveling with emotional support animals must present current documentation, prior to boarding, to one of our customer service agents. It must not be more than one year old and it must be on letterhead from a mental health professional or medical doctor who is treating your mental health-related disability. Several types of emotional support animals are prohibited from flying. Pets allowed in the passenger cabin of Alaska Airline include dogs, cats, rabbits, household birds, and tropical fish. Dogs and cats must be at least eight weeks old and must have been fully weaned for at least five days prior to travel. The fee to travel with a small pet is $100, the pet must stay in their carrier and be able to fit under the seat in front of the traveler or in the adjacent seat, when that seat is purchased. There is a limit to how many pets can fly on each plane, so travelers need to reserve in advance. Most pets are also allowed to travel in the cargo hold as well for a $100 fee. 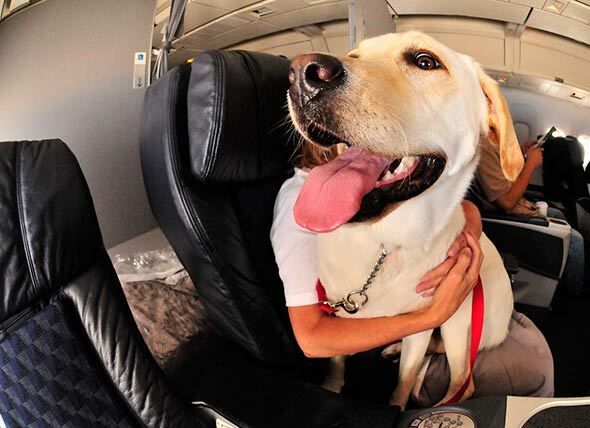 Service animals are welcomed on JetBlue free of charge. They must remain on the floor unless the animal can fit completely and comfortably in the owner’s lap. The owner should also make sure to add their service animal to their reservation before flying. The same rules apply for emotional service animals, which should also be well-behaved and have their required documentation. There is a large list of emotional support animals that are not accepted on the JetBlue Airways even with documentation. JetBlue gladly accepts small cats and dogs in the aircraft cabin on both domestic and international flights. There is a pet fee of $100 each way and the combined of the pet and carrier may not exceed 20 pounds. The pet must remain inside its carrier while at the airport and in the aircraft for the entire flight, and underneath the seat in front of the traveler during taxi, takeoff, and landing. Only four pets are allowed pet flight. Have you flown with your pet? What has your experience been?